What Your Pet Says About You: Personalities and Looks to Match? Pets and Owners: Personalities and Looks to Match? Perhaps you've been down at the park on a sunny afternoon and marveled how one woman looked just like her Poodle, or how the guy playing Frisbee with his Golden Retriever seemed to be a dead-on match for personality. Are we imagining these nuances, these tendencies to look or act like our pets? Actually, there have actually been studies done on this topic! As pet owners, we tend to treat our dogs, cats, you name it, like friends and confidantes, so it's no wonder we actually start to take on some similar characteristics over time. These characteristics match not only physically but in personality as well. Read on! A very clear argument can be made about pet owners looking like their pets. The answer, it seems, is all in the eyes. In fact, a study out of Japan conducted by Sadahiko Nakajima aimed to tackle this very issue. You may think, upon seeing an owner with his pet, that the physical resemblance has to do with perhaps the hairstyle, gender or height. 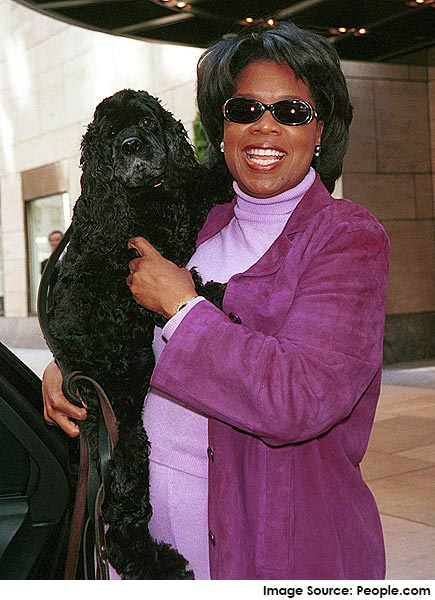 Take a look at the similar hairstyles of Oprah and her Cocker Spaniel Sophie, the matching wild smiles of Denise Richards and her pooch Scooter, or the youthful looks of Harry Styles and his Bear. Heck, even the First Dog bears a resemblance to his powerful owner. However, all those physical traits aside, the Nakajima study found that the resemblance doesn't have much to do with hair, gender or any of that; rather, the similarity is actually conveyed through the eyes. If you want to get sappy about it, you can say that the eyes are the window to the soul, and this is how both owners and pets gain their connection. But whether you believe in all that stuff or not, the physical matches are uncanny in many situations. According to Slate, this is because we have the ability to take meaningful psychological cues from the eyes. In addition to physical similarities, many people bear strong personality matches to their pooches and other pets. This most likely stems from familiarity, as humans tend to choose pets based on what they're used to. In essence, we choose pets who remind us of ourselves. That in-shape guy playing disc golf in the park chased by his Golden retriever made a perfect choice in a pet mate, as retrievers are inherently social and playful creatures who have lots of energy to burn, especially as puppies. The young lady strutting down the city street with her Yorkshire Terrier, sporting matching pink bows, are also a perfect match – terriers are known for showing off their style and beauty. That friend who never gets bothered by anything and takes matters in stride likely has a mild-mannered, aloof cat at home. There's no denying the personality match between pets and owners. For more insight into the physical and personality characteristics of pets and their owner, check out Pet Premium's infographic. Are you that guy in the park who is always running and into every extreme sport out there? Then the over-excited Labrador Retriever might be the perfect match for you. Are you that petite girl with a Napoleon Complex? Then a tiny, bossy Chihuahua could be your perfect match. Are you open, imaginative and always up for whatever? Your perfect match could be a toy dog such as a Maltese or Shih Tzu – according to Live Science, these dogs are known for their curious nature and imagination. Are you emotionally stable with a strong sense of self? Then your best bet is to go with a hound dog such as a Beagle or Afghan. Are you an extrovert who loves to just be around people? Go with a pastoral or utility breed such as German Shepherd or Bulldog. Check out Pet Premium’s extended dog breed database to find the breed that’s perfect for you!